-It is good to love many things, for therein lies the true strength, and whosoever loves much performs much and can accomplish much, and what is done in love is well done. -If you truly love nature, you will find beauty everywhere. -I am always doing what I cannot do yet, in order to learn how to do it. -If you hear a voice within you saying, You are not a painter, then by all means paint… and that voice will be silenced. Some of Vincent Van Gogh‘s painting quotes above illuminate something that can be lost when art becomes a chore or liability. It is easy for the love it to go. And it is easy to get lost in the realistic stress of money. While that remains an ever-present concern, it should never consume the love and commitment required to create art. As alluded to in the second quote, art does not have to be a grand gesture, rather how you bring a series of small ones together. I came across the first of the painting quotes in Why We Make Art and Why It Is Taught 2010 by Richard Hickman where he asks the question “Yet what function or purpose does art satisfy in today’s society?” which is an important issue all artists should be asking themselves. While there is no ‘single’ answer, I encourage anyone who is curious about the use of their art to think about that and read Why We Make Art and Why It Is Taught. That question seems most relevant to Van Gogh; sometimes posing questions as such can result in solidifying one’s own purpose or definition of art. We can apply the question of why we make art to Vincent Van Gogh. Why we make art is a question that is answerable to a point. It is a form of communication but as to what it communicates or conveys is up to the individual. While some use art to talk about politics, others use it to express ideas; some use it as a form of healing while others focus on creating works that are made to enhance an atmosphere. From reading Vincent Van Gogh painting quotes, one can ascertain his driving force, love. Vincent Van Gogh, 1853-1890 is well-known for Starry Night 1889 or Café Terrace at Night 1888. Most noteworthy, Van Gogh saw the work of the Impressionists first hand, then the Neo-Impressionists and painted in response; he adapted the method by lightening his palette and experimented with broken brushstrokes of the Impressionists. From that, he paired it with the pointillist touch of the Neo-impressionists. Vincent Van Gogh utilized his knowledge and skill of painting along with techniques he observed. As a result, he developed a unique style that helped him convey how he sees the world. 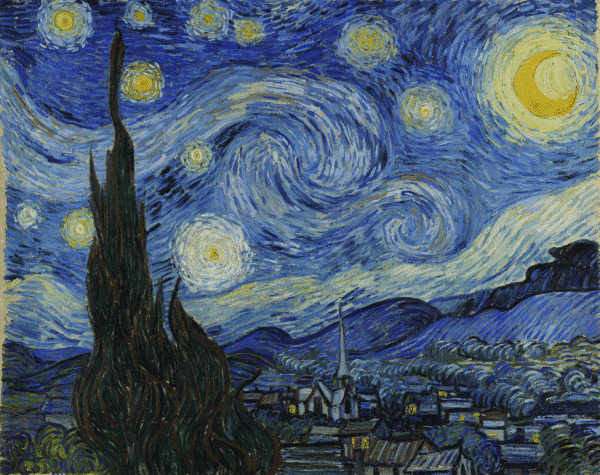 Van Gogh’s paintings showed the hidden flair he was captivated by in the world. That in itself is what can set artists apart; one does not need the ambition to create something new, rather it is sharing a way of seeing the world.